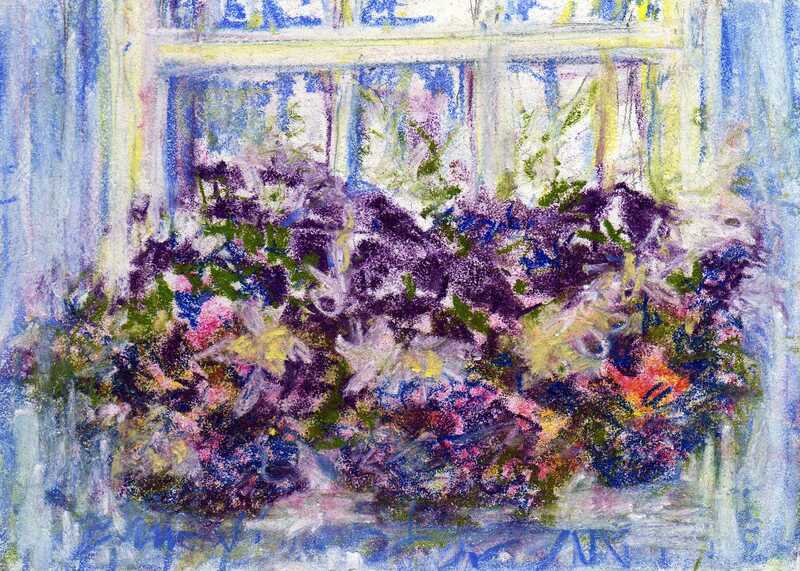 My picture today is of a painting I did of a window box of petunias with sweet alyssum (though the alyssum really appears as an abstract smudge of white). Sweet alyssum, Lobularia maritime, is one of the favorite flowers of butterflies. Everyone enjoys seeing butterflies—they bring beauty and charm to the garden. In the Middle Ages the butterfly was used in paintings to symbolize the soul, a reference to the metamorphosis from caterpillar to pupa to butterfly, analogous to the journey of the soul from heaven to earth and back to heaven. Many of our heirloom flowers attract butterflies. If we can make our garden attractive to butterflies, they will come seeking food and breeding sites, and stay for awhile. Adult butterflies feed only on liquids, nectars of flowers, tree sap from wounded trees and water. They appreciate the water in mud puddles, which will give them mineral nutrients. Some flowers attract butterflies more than others. Simple flowers from which they can easily extract nectar are preferred. In the spring butterflies are hungry and seek out early flowers such as buttercups, aubretia, perennial alyssum and creeping phlox. 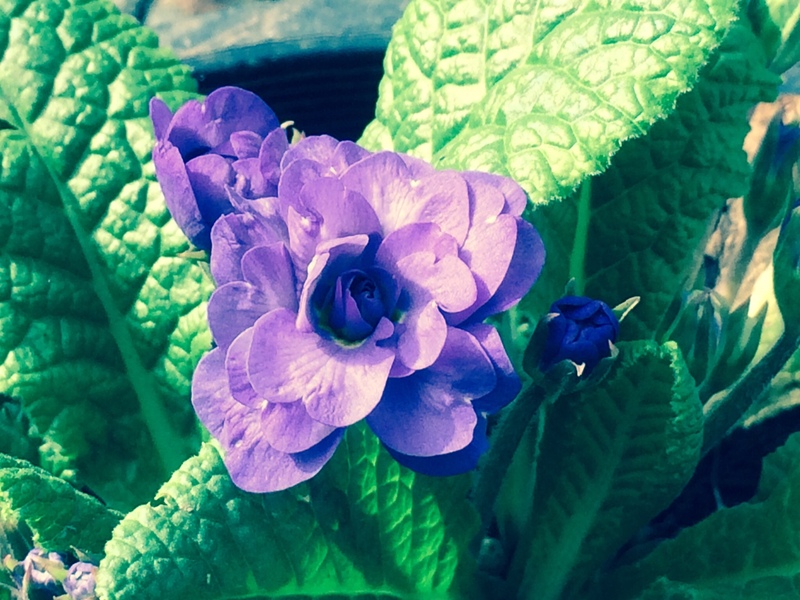 They also like primroses, candytuft, arabis and English bluebells. Purple flowers are their very favorites, especially sweet rocket, scabiosa and lilacs. Herbs are very good nectar plants also, including most notably catmint, thyme, lavender and hyssop. In mid to late summer butterflies will visit phlox, goldenrod, gaillardias and any single daisy-like flower. There is a famous plant that butterflies love called Buddleia, known by the common name ‘butterfly bush’. It is tender in USDA zone 4 to 5 in Montana, but will most likely survive the winter in a warm, south facing wall. In this climate it will die back to the ground and re-sprout in the spring. The flowers come in a long inflorescence of tiny fragrant blooms in August and keep coming on until frost. The fragrance reminds me of soda pop. Butterflies will return to the flowers again and again. The fall blooming Sedum spectabile is attractive to butterflies as well as to bees. Both will compete to get to the nectar-filled flowers in September. 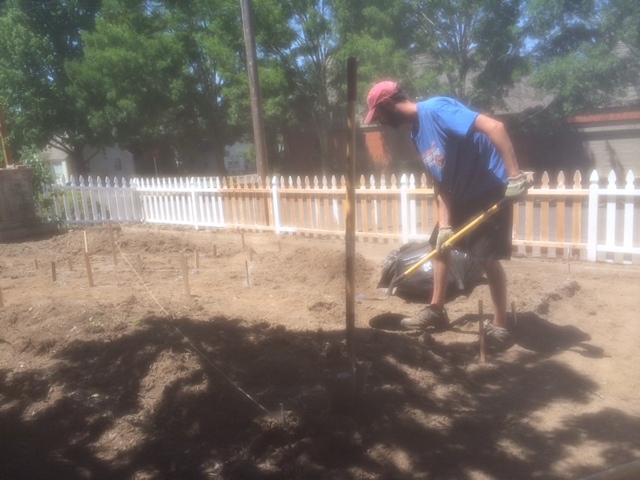 The plant likes well-drained soil and a hot spot. One more favorite is mignonette, a fragrant annual flower easily grown with very fragrant insignificant flowers. Mignonette was brought from Egypt by Napoleon’s returning military core in the early 1800s. 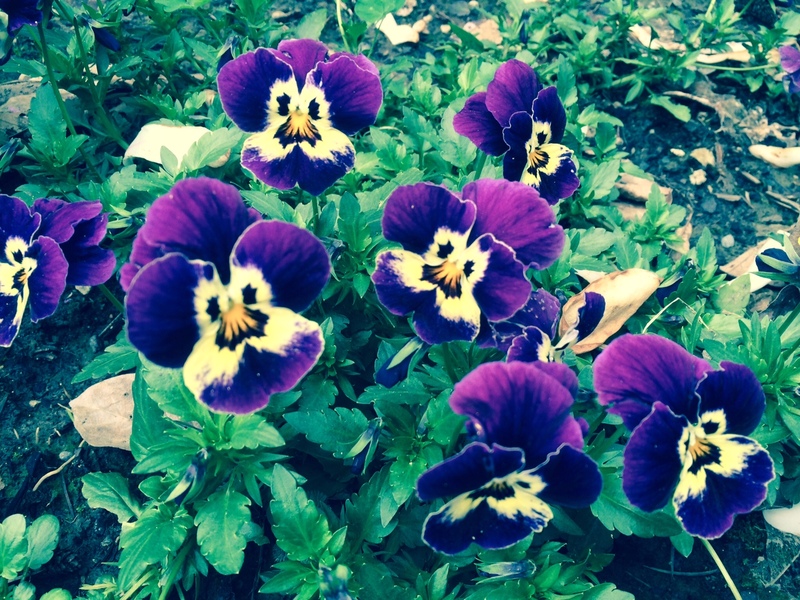 It is a valuable heirloom, wonderfully scenting a cottage garden. Actually, the more wild, weedy and meadow-like your garden is, the better to attract butterflies; they will stay and raise their young. An organic garden is safer for them. It is best to never spray any pesticides (including OMRI approved ones) in your butterfly garden. Bacillus thuringensis (BTK), or pyrethrins, or soap sprays will all harm them and/or their young. Butterflies lay eggs on several plants. The Painted Lady butterfly will lay eggs on any kind of thistle. Swallow Tails lay eggs on carrots or parsley, but if you see a caterpillar or two you can move it to a plant of Queen Anne’s Lace where it will get all the food it needs and pupate. The beautiful Monarch butterflies lay eggs on milkweed. Other favored plants for butterfly nurseries include: alfalfa, fennel, nettles, clover, vetch, dock, poplar and elm. Several species need a particular plant for their larvae to eat, and most of these hosts are native plants. A flower filled, weedy butterfly garden is perfect for anyone wanting a low maintenance garden. It is wonderful for children and for older people because there is no mowing or weeding. All of your garden, or just a section of it can be devoted to a colorful, natural butterfly haven. Other creatures will come as well, and damage from deer will not be as noticeable as in a garden full of introduced, water-hungry plants with big flowers and moist stems and leaves. Native shrubs and trees might be included as well. If your climate is dry and fire is a concern, your butterfly garden might be situated away from your home and outbuildings. Enjoy the beauty and fragrance from nature’s own heirloom garden of butterfly attracting plants. The first zinnia species introduced to the United States was Zinnia elegans from Mexico in 1793. It was a single form; double forms were introduced in 1858. Zinnia haageana, another Mexican species was introduced in 1876. A nursery catalog from 1876 sent out by Henry H. Dreer of Philadelphia describes Zinnia haageana as “A double variety of Zinnia mexicana; flowers deep orange, margined in bright yellow.” These species were crossed together and a wide color range created, as well as new flower forms. Few old seed strains exist today; the oldest hybrid seed strains I have located are the ‘Cactus’ mix from 1928 and the ‘California Giants’ mix, also from 1928. 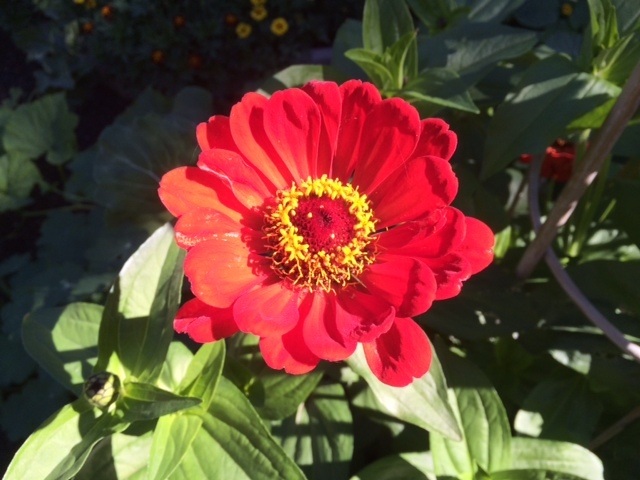 In the photos above, the red semi-double zinnia is one I grew this season, of the variety ‘Will Rogers’ from 1940. The flowers of this strain are most often semi-double, but sometimes fully double. The flowers are a beautiful warm shade of red. 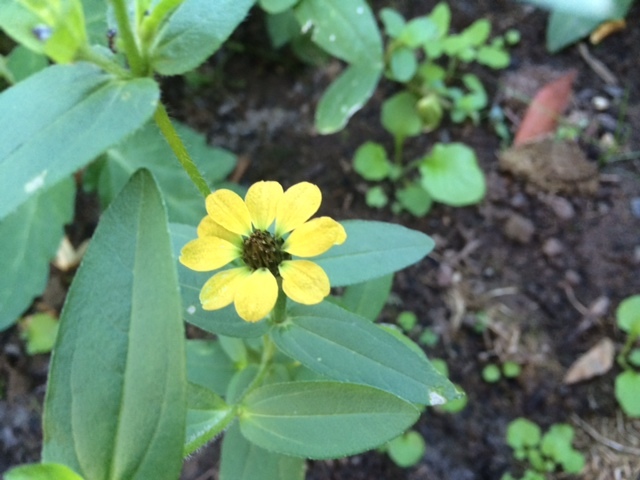 The other two pictures above show the much smaller flowers of Zinnia peruviana, a species from Mexico with a range extending into South America. These come in earthy yellow and red shades. Zinnias can be started indoors if you need to start them early and in areas with cool or short summers transplants can be set out after danger of frost has passed. The seedlings will need plenty of light in all stages of growth (inside, too) so they will not become thin and floppy. Seeds can be direct sown about the date of the last frost or later if your season permits. Zinnias enjoy heat and sun. 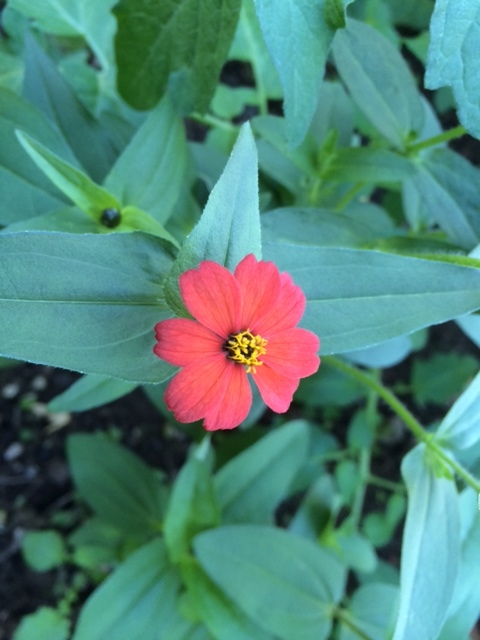 Some of the most prolific plants I have seen were grown in the desert Southwest, but they seem to do well in most of the U.S. Why not try one or two older seed varieties of zinnia?